When stones kick up when you are driving, they can damage your windshield. 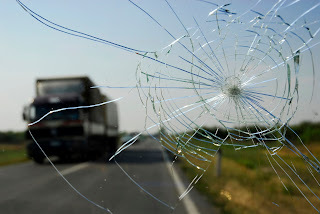 Even the smallest stone can create a small crack in the windshield, which can lead to a much larger crack. There are a few steps that you can take to keep this from happening. After you have purchased your used car in Tacoma, WA you should discuss having them add an extra coating to the windshield. This is an invisible coating which protects the windshield from being damaged by debris. The coating would add a thin layer of plastic or resin to the glass. It may add to the cost of the car, however, it will save money on repairing or replacing the windshield if a rock kicks up and hits it. Polyester films are an invisible coating which provides your windshield extra protection against small stones and other debris. There are a variety of these products available. If you would like more information on windshield protection, windshield repair, or you are looking for a used car in the Tacoma, WA area, visit us today!! !